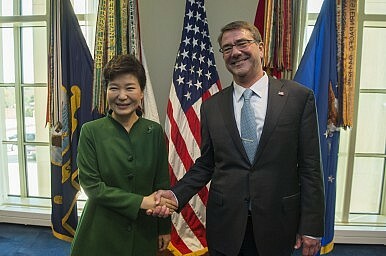 South Korea and the United States reaffirmed their alliance and set out new areas for cooperation. South Korean President Park Geun-hye met with U.S. President Barack Obama on Friday, marking her second official visit to the United States during her tenure as president. Park’s visit was originally scheduled for mid-June 2015 but was postponed due to South Korea’s public health crisis stemming from the the Middle East Respiratory Syndrome (MERS) virus. Park arrived in the United States on Tuesday for a four-day visit with an extensive agenda covering bilateral defense, economic, and political cooperation with the United States, South Korea’s most important ally. On Friday, following Park’s meetings with Obama, the two leaders released two joint statement: “The United States-Republic of Korea Alliance: Shared Values, New Frontiers,” a general statement on the state of the U.S.-South Korea alliance and its future, and “United States-Republic of Korea Joint Statement on North Korea,” a more specific statement on how the alliance will handle denuclearization of the Korean peninsula and North Korean provocations. Park and Obama agreed to maintain and deepen the U.S.-South Korea alliance, reaffirming several important bilateral developments on that front over the past year. They affirmed last October’s agreement on the postponement of the transfer of wartime operational control (OPCON), South Korea’s development of a preemptive Kill-Chain and Korean Air Missile Defense system, and the “common goal” of “complete, verifiable, and irreversible denuclearization of North Korea in a peaceful manner.” The joint statement also contains a detailed range of bilateral commitments on cybersecurity collaboration between the two countries. Notably, the issue of a possible deployment of a Terminal High-Altitude Area Defense (THAAD) missile system to counter North Korean ballistic missiles did not make an appearance in the joint statement. China has been particularly sensitive to the possible deployment of THAAD systems on the Korean peninsula. In March, Chinese and South Korean diplomatic representatives exchanged sharp words over the issue. The language on the bilateral economic relationship in the Park-Obama joint statement this time around was somewhat predictable. Notably, the statement reemphasizes the United States’ position on welcoming South Korea into the recently concluded Trans-Pacific Partnership. The statement notes that under the existing South Korea-United States free-trade agreement, “has already adopted many high standard provisions.” In an address on Thursday at the Center for Strategic and International Studies, a Washington, D.C., based think-tank, Park noted that “Korea welcomes the TPP agreement reached last week.” She emphasized that South Korea had already “signed trade agreements with 10 of the 12 TPP member countries” and described her country as a “natural partner” for the TPP. Beyond the TPP, the joint statement included little new on bilateral economic cooperation with the exception of a commitment to reconvene the U.S.-South Korea senior economic dialogue later this year to enhance engagement of strategic economic issues. During a joint news conference on Friday, Obama and Park addressed possible diplomatic approaches to North Korea. “At the point where Pyongyang says we’re interested in seeing relief from sanctions and improved relations and we’re prepared to have a serious conversation,” Obama noted, suggesting that the U.S. position on talks with North Korea may have softened from the earlier U.S. position that North Korea would have to take action to demonstrate a bona fide interest in diplomacy. Park echoed Obama’s remarks, noting, through a translator, that “you need to have this genuine willingness on the part of North Korea that they will give up nuclear capabilities.” Regardless, both leaders noted that they would never accept North Korea as a nuclear weapons state. Interestingly, when China came up at the joint press conference, Obama made it abundantly clear that the United States didn’t see South Korean closeness with China as a negative. Park’s participation at China’s September 3 military parade raised concerns about Beijing’s intentions toward Seoul. “We want South Korea to have a strong relationship with China, just as we want to have a strong relationship with China. We want to see China’s peaceful rise. We want them to be cooperating with us in putting pressure on the DPRK,” Obama noted. For her part, Park has been open about discussion possible one-on-one talks with Japanese Prime Minister Shinzo Abe during her stay in the United States. Speaking on Thursday evening at CSIS, Park noted that she thought a bilateral with Abe would be possible. She noted that she looked forward to the resumption of the long-stalled trilateral leaders’ summit between China, Japan, and South Korea. “The trilateral meeting allows us to hold in-depth talks not only with China but also with Japan,” Park noted on Thursday. “I do feel that I can have a bilateral meeting with Abe,” she added. The joint statement affirmed a joint U.S.-South Korea commitment to the trilateral with Japan, an important priority for the United States. For the Obama administration, tensions stemming from historical tensions between South Korea and Japan have been a constant source of frustration in Northeast Asia. The United States would prefer to have its two allies cooperate in a trilateral format without underlying tensions. Despite the massive detail and breadth of the joint statements issued after the Park-Obama meetings, including a section on “Meeting Global Security Challenges” and “Exploring New Frontiers of Cooperation,” maritime security is nowhere to be found. Recent U.S. joint statements with Australia, India, and Japan–all Asian democracies and U.S. allies and partners (in the case of India)–have included strong references to supporting international law in a maritime context and, in some cases, have directly called for the peaceful resolution of Asian maritime disputes in the East and South China Sea directly. This omission in the U.S.-South Korea joint statement is somewhat telling of Seoul’s reluctance of being drawn into these disputes as a result of its alliance with the United States. For South Korea, relations with China are taking on a new degree of importance as Beijing tilts toward Seoul. Overall, Park’s visit to the United States and the result of her talks with Obama highlight that the U.S.-South Korea alliance is as healthy as ever and the bilateral relationship continues to broaden. In fact, beyond what I’ve mentioned here, the joint statement notes cooperation on the environment, climate change, space exploration, science and technology, and cultural exchange. There’s no doubt that Washington continues to see Seoul as central to its position in the Asia-Pacific. Meanwhile, South Korea continues to acknowledge that both its security and regional relevance will be buttressed by ongoing coordination and cooperation with the United States. From here, it’ll be worth watching how Seoul’s burgeoning dialogue with Beijing affects its alliance with the United States. China won’t substitute what Seoul and Washington have, but it may increasingly set the parameters for what is possible within the alliance. With their leaders set to meet in November, South Korea and China may be due for a thaw in their bilateral relations.